"There were no specific reasons which made my non-participation obvious. I accept this decision, of course, wholeheartedly, but that does not mean that I respect it." Björn Thurau had big hopes of doing his first Tour de France after his move from Europcar to Bora-Argon 18. Hence he was disappointed when he was informed Sports Director Enrico Poitschke that he had not made ​​it into the 9-rider squad. "I was really shocked," Thurau told radsport-news.com. The 26-year-old has been very visible in the first half of the season with offensive riding, most recently until the Criterium du Dauphine. However, the team management decided against Thurau who did not hide that he doesn't understand the decision. "There were no specific reasons which made my non-participation obvious. I accept this decision, of course, wholeheartedly, but that does not mean that I respect it," he said. According to Thurau, he would have been able to do more than going on the attack. "I would certainly offer attractive riding. And certainly I would have been in top shape to perform important domestique roles. Furthermore, I have experience which I would use to help Dominik Nerz," he said. "Unfortunately that does not seem to be enough." But Thurau does not want to let the disappointment make him slow down. Instead, he already focuses on the German Championships in Bensheim which will be held on a course that should suit him. "I will respond with power. 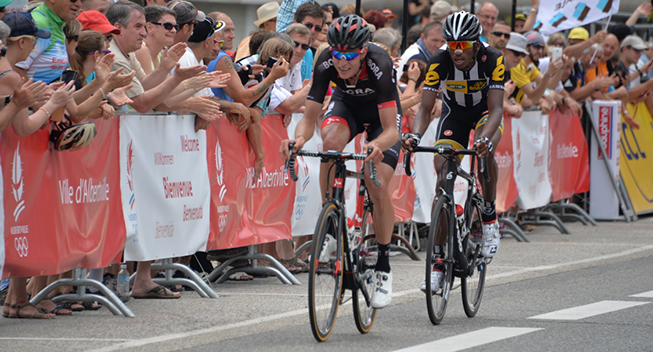 I feel good and will do my best to be up front at the end of the race," Thurau announced.